You can create and host a public website to use with Office 365 by working with one of Office 365's partner providers, if you like. These partners help Office 365 customers set up a complete online presence. (If you already have a SharePoint Online Public Website, you can create a new one with a partner and manually migrate your current content.) You'll design and manage the website at the partner website; the website not integrated with Office 365. If you already have a public website hosted somewhere else, you can keep your website with your current hosting provider. To set up a new public website, sign in to Office 365 and choose a partner to work with. Then follow the steps to sign up with the partner, create your website, and (if you like) set it up with your domain for the website's address, like www.contoso.com. Choose Learn more for a partner. If you have a SharePoint Online Public Website, you'll also see a link to manage your website. 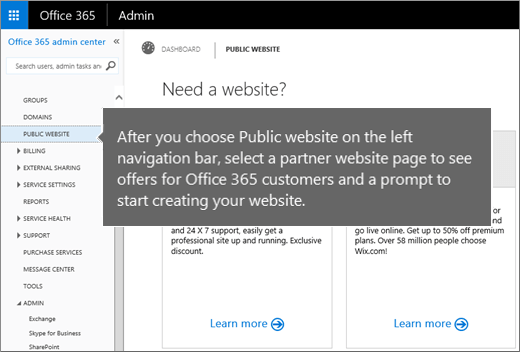 On the partner website page that opens, you'll see the special offer for Office 365 customers and a prompt to start creating your website with the partner. After you create your website, the partner site will guide you through publishing your website so other people can access the site by using a friendly URL with your custom domain, like www.fourthcoffee.com. If I already have a public website set up in Office 365, can I keep it? Yes, if you have an Office 365 subscription that already has a public website, there are no immediate changes. However, as part of the evolution of the Office 365 service, the current SharePoint Online Public Website offering was discontinued on March 9, 2015. If you already have a website, you can continue to use and update your site for a minimum of two years after this changeover date. But moving forward, you will need to plan for moving to a partner offering or another provider for public website functionality. How do the new partner website options compare with the SharePoint Online Public Website option? The existing SharePoint Online Public Website feature was designed for customers who needed only a basic online presence. The new solutions provide better tools and solutions needed for delivering, supporting, and managing a more complete online presence. If I want to move my current SharePoint Online Public Website to one of the partner sites, how do I do that? We provide general guidance that can help you move your website's content to one of the partner solutions. More detailed information about setting up and customizing websites is available in Help articles at the partner sites. Is there an additional cost for setting up a public website with a partner? The partner sites offer access to tools and services that let you create a more full-featured website solution than the SharePoint Online Public Website, with special discounts available to Office 365 customers who come to their sites using links from Office 365. The cost is in addition to the Office 365 subscription, and the specific terms and details vary by partner and by market. Can I use other public website solutions with Office 365? You can use any website hosting service to set up a website; you don't have to use the partners listed in Office 365. However, if you use the links in Office 365 to go to a partner website to set up your site, you can take advantage of discounted offers that are only available to Office 365 customers. I'm using my custom domain in Office 365 for the website address (URL) for my SharePoint Online Public Website. When I create a new website at a partner site, how do I set up the new website to use my domain for the website address? That depends on how the DNS for your custom domain in Office 365 is managed: at your domain registrar (or DNS host) or by Office 365 (your domain's nameservers are directed to Office 365 nameservers). Tip: Not sure how your domain's DNS is managed in Office 365? Go to Domains > Manage domains, and select your domain name. Choose Manage DNS, and look under DNS Management. If you manage DNS for your domain at your DNS host, you can change the records for your domain that are currently pointing to your SharePoint Online Public Website to direct to the new website instead. You can find help at the partner website to learn more about how to do this. If Office 365 manages the DNS for your domain, the records will be updated for you at Office 365 so visits to your domain address will go to your new website. Want more information about how the public website partnership works with Office 365? Details are included in this article.